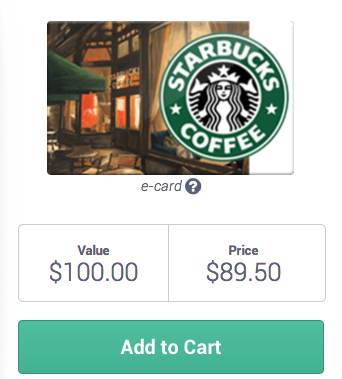 Raise.com sells discounted gift cards. When you spend $80 or more and use Promo Code TREAT80, $5 will be knocked off the price. Promo codes are one time use per account. 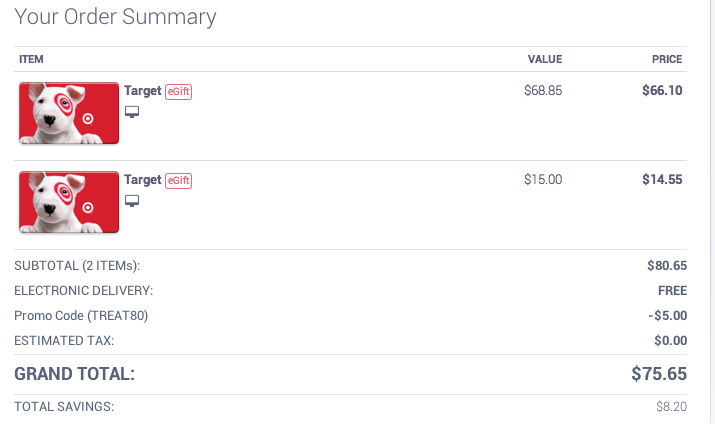 As you can see in the picture, I spent $75.65 for $83.85 worth of Target Gift cards. I started my purchase at Top Cashback so I got another 2% of $75.65 back into my account. I used my Discover it Credit Card because they offer 5% cashback for online purchases until the end of the year. In addition, I will still be getting my 5% Target Red Card Discount when I use the gift cards, even though I won't be using my Target card. Grand Total - I will end up paying $66.57 for $83.85 of Target money. That's a discount of almost 21%! I know I will spend money at Target so I wait for these promo codes and I always buy even though I don't need more Target money yet. This way, I will always be getting a serious discount. You can read more about Extreme Savings at Target at this post.